The Iranians with this Real Revolution going on today all over the country, unlike the fake one in 1979, that now proven to have been the foreign powers’ sponsored regime change and a very elaborate political deception by foreign powers secret services - want to bury mullahs' illegitimate regime of foreign puppet Dictator and Despot Mullah Ali Khamenei, with his corrupt mafia cliques, as soon as possible. See the link below to New York Times article. Last edited by Surenareal on Tue Feb 06, 2018 10:14 am, edited 1 time in total. Mullah Ali Khamenei traitor and his mullah mafia cliques receive their orders and daily agenda form British agents’ expert in propaganda, and Crude Oil Companies agents in their offices. This traitor Mullah Ali Khamenei has effectively made Iran mullahs illegitimate regime today into a British Colonial Protectorate. Also, Mullah Ali Khamenei's grand-son's mother was deliberately taken to London to give birth, to make his grand-son have dual citizenship. It is a well-known historical fact that since the late 18th century, most mullah groups in Iran are England Assets, and have been receiving monthly stipend from England. Last edited by Surenareal on Tue Feb 06, 2018 10:13 am, edited 1 time in total. Since, no country by its own people cannot decide to go backward in time, unless it is forced upon them by the stronger foreign powers for those powers own national interests. That is exactly what happened to Iran in 1979 foreign sponsored regime-change and Coup d’état of 22 Behman 57, after more than four years of preparation. (see confessions of Jafar Shafiezadeh), " The Hidden Hands Behind the 1979 Regime-Change and Coup d’état in Iran". So, this foreign puppet mullahs’ illegitimate regime - headed by the foreign puppet despot and dictator mullah Ali Khamenei - has been originally installed in Iran to safeguard the interests of the same foreign powers who brought mullahs (Khomeini the accursed) to power in Iran. Therefore, this foreign puppet mullahs illegitimate regime will never ever work for the national interests of the Iranian nation, it is an occupying anti-Iranian regime and the enemy of Iran and Iranians, they must be overthrown by any means, and with any cost as soon as possible. Last edited by Surenareal on Tue Feb 06, 2018 10:12 am, edited 1 time in total. With all due respect, you are beginning to sound like a broken record which skips over and repeats the same note! What you are preaching here has been said thousands of times before by the conspiracy theorist monarchists. Everyone has heard it before. Instead of accepting responsibility, you blame UK. Everyone knows UK, US, France and others were partial causes of the 1979 Islamic Revolution but they were not the main cause. How come UK cannot make a regime change and a revolution or as you refer to it a coup in America, France or Germany? How come these episodes only happen to Iran? Maybe it is because Americans, French and Germans are not a bunch of backward, uneducated, religious fanatic Muslims who allow UK to run their lives! Has that ever occurred to you? The main cause of 1979 Islamic Revolution is the Iranian people. It is time for the Iranian people to take responsibility for their own mess up. Maybe you and I didn’t overthrow Shah but the majority of Iranians did. Until we do not accept responsibility for our own actions and misery and until we blame others such as UK for our misery, we will remain miserable forever and nothing will be changed or fixed. The root of our misery is us, not America, not Britain and not west. It is time to accept responsibility and change ourselves. What you are preaching here is old news and everyone knows about it. What you call proof is rhetoric of Fouladvand or some other monarchist parroting and adding their own bias to memoirs of an Islamist thug. This is monarchist propaganda to find someone to blame for 1979. If anyone is to blame is the Shah and the monarchists who didn’t stand and fight like men, but they escaped and handed Iran to Khomeini and Islamists. What kind of leader set a Shah escapes the battle because General Huyser and CIA and MI6 told him so? You are not here to find a solution but you are here to divert from real causes and seeking real solutions. What you are repeating over and over doesn’t belong here under this topic. Repeating yourself over and over and directing the readers to a 60 parts narrated conspiracy by a monarchist as a historical proof will not change anyone’s mind here. Repeating something over and over can only make yourself to believe in what you preach. Our readers are not elementary school students which you want to inject conspiracy into their brains. Our readers are highly educated Iranian student movement, democratic movement and opposition. You think you are informing people of something new but you are repeating an old conspiracy theory to make Iranians feel better about themselves rather than accepting responsibility for their own doing. Your advertisement for monarchy is also getting too old for anyone to buy in 21st century. Instead of looking to the future, you are dwelling in the past and failing to see the real cause, effect and to learn from history. We heard it all before, nothing new. Reply to AQ: We need to zoom out our political views and see the big picture in international big powers politics. This is also called big-powers games. The major world powers have always historically exploited fully, for their own national interests, any political opportunity that is presented in the weak and politically backward countries - those countries that do not have strong political parties and solid party tradition - especially the crude oil producing countries like Iran. Unfortunately, due to lack of strong political system and well established political parties in Iran; most Iranians have no or insufficient understanding of big powers politics, and have wrong views of the role of major world powers in international politics. They even see these powers as benevolent father-figures. Whereas these major powers think like most businesses persons do, as they say, business is business, you don't mix business with feeling sorry for your competitors, or other competing weaker and politically backward countries, this is known as "real politic." Last edited by Surenareal on Sun Feb 11, 2018 9:47 am, edited 3 times in total. Medieval mullahs’ illegitimate regime and their mafia cliques, by their criminal actions and high treasons have made Iranians realize that, they have been fooled and deceived for 39 years by those foreign powers who organized and sponsored 1979 regime-change and 1979 Coup d’état in Iran (Coup d’état ye 22 Bahman 57). Today overwhelming majority of Iranians know that the despot tyrant and foreign puppet dictator mullah Ali Khamenei has sold their country to those foreign powers, in exchange for protection of his illegitimate regime. The medieval mullahs have imposed themselves on the Iranians using brute force and arab mercenaries and have committed high-treason in daily murders of the patriotic Iranians. It is now clear that those foreign powers propaganda machines can no longer keep traitor mullahs’ illegitimate regime in power, since people of Iran have discovered all the facts and the strings linking puppet Khamenei, and his mafia cliques, to their foreign puppeteers. Today overwhelming majority of Iranians know for facts that mullahs’ illegitimate regime has been originally, brought to power in a Coup d’état in 1979 and installed in Iran by the same known foreign powers to safeguard their interests and the interests of their Crude Oil Companies. Iranians know for fact that foreign puppet mullahs’ illegitimate regime will never ever serve the national interests of Iran, or work for progress and advancement of Iran and Iranians. The medieval mullahs illegitimate foreign puppet regime must be overthrown as soon as possible. Last edited by Surenareal on Tue Feb 06, 2018 10:07 am, edited 1 time in total. The main reasons of the support of mullahs’ illegitimate regime and its interventions in countries such as; Syria, Lebanon, Yemen and terrorist groups in these countries; Hezbollah, Hamas or Palestinian groups is because, from the very beginning of the installation of this illegitimate regime by foreign powers, they used trained terrorists from these arab countries extensively, as executioners, pasdars and armed guards, to install mullahs’ illegitimate regime in Iran. So, the very survival of this illegitimate regime is dependent on the daily help of these foreign mercenary terrorist groups, even today. This is why this illegitimate regime spends more money on these foreign arab countries terrorist groups than on Iran and Iranians. Also during the preparation of the 1979 Coup d’état in Iran and after it, in the past 39-years, these same non- Iranian terrorist groups have saved this mullahs illegitimate regime for this long, and have been serving as regime's mullahs body-guards and as bassijis, pasdars, plain-clothes that are mostly from these arab countries (for more facts and evidences about this, see "Confessions of Jafar Shafizadeh", in 60-parts audio files on YouTube, are also posted on this IPC website under this same rubric). Last edited by Surenareal on Tue Feb 06, 2018 10:02 am, edited 12 times in total. You can delete your own repeated posts. You have the deletion power. On top right of your posts, you have the “X” button which means delete. You also have “Edit” Button and “Quote” buttons. As long as you keep on repeating yourself and experimenting with posting formats or consecutive repetitions of posts, please delete your own repeated posts. Thank you for your explanation on how to delete a repeated post. If Iranian Women stop wearing hejab in the streets, who can stop them? What will IRI do, arrest half the population? 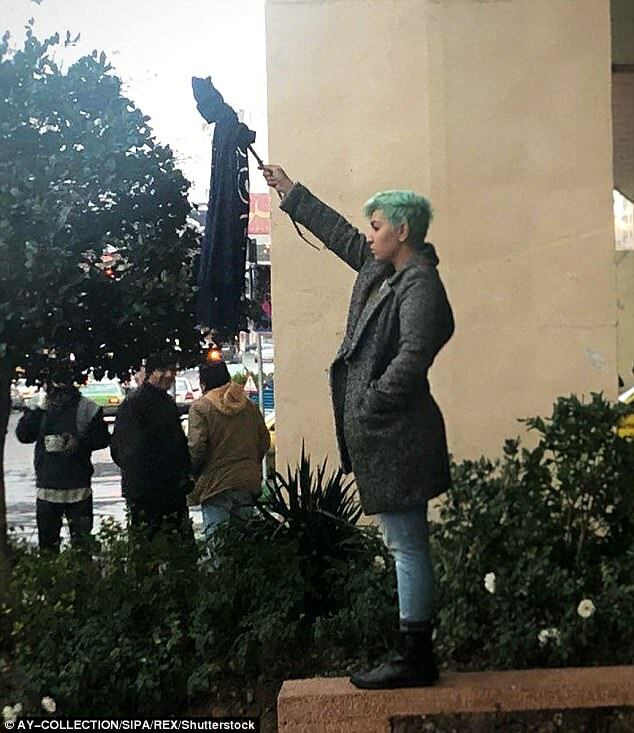 Protests against the compulsory wearing of hijabs in Iran have continued despite the arrests earlier this week of 29 women for appearing in public without a headscarf. Symbolic protests took place throughout the country this week with women posting videos and photographs on social media of themselves standing on utility boxes, street sidewalks and other public places as they defiantly waved their hijabs. Chief Prosecutor Mohammad Jafar Montazeri played down the escalating protests on Wednesday, saying they were 'trivial' and 'childish' moves possibly incited by foreigners. The defiance of the women comes as an influential Iranian activist said that disquiet over the hijab showed that women are symbolically rejecting the wider 'interference of religion' in their lives. 'We are fighting against the most visible symbol of oppression,' said Masih Alinejad, who hosts the website My Stealthy Freedom where women in Iran post photos of themselves without hijabs. 'These women are saying, 'It is enough - it is the 21st century and we want to be our true selves,'' the Iranian activist told the Thomson Reuters Foundation. Iranian police said on Thursday that 29 women who took part in the campaign had been arrested in Iran for protesting against the country's compulsory hijab rules, the semi-official Tasnim news agency reported. Those arrested were accused of public order offences and referred to the state prosecutor's office, Iranian media reported. 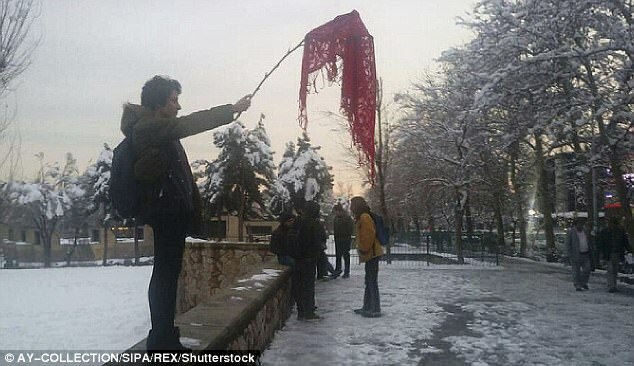 Alinejad said the protests picked up momentum after video and images were posted online of a woman waving a white scarf on a stick in December - a day before demonstrations erupted against economic conditions in eastern Iran. Unrest quickly spread across the country and the focus broadened as protesters began calling for Iran's supreme leader, Ayatollah Ali Khamenei, to step down. The video went viral as police cracked down, and Alinejad said the woman was arrested. She has since been released, according to a Facebook post by Iranian human rights lawyer Nasrin Sotoudeh. 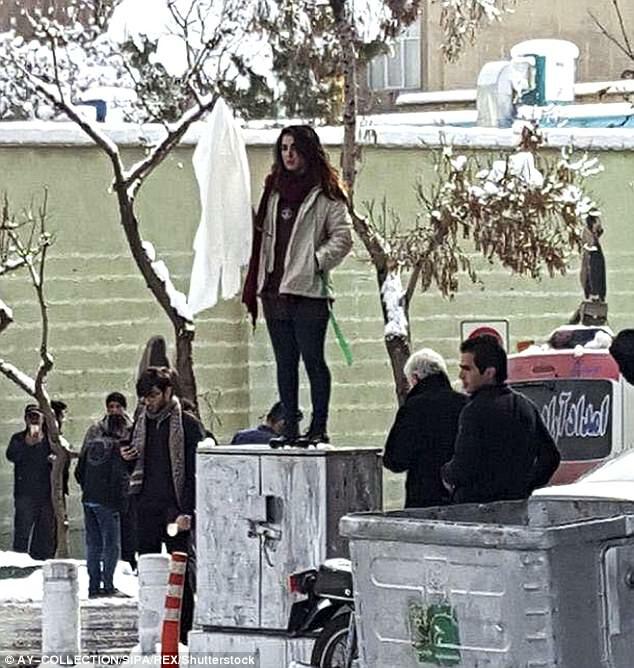 On Monday, a woman named locally as Nargess Hosseini, was arrested after standing on an electricity box in central Tehran, waving her head scarf in front of her. Journalist and campaigner Masih Alinejad, the founder of the White Wednesdays and My Stealthy Freedom movements, which fights the compulsory hijab in Iran, has claimed that Ms Hosseini's bail has been set at a record-high level to detain others from protesting. 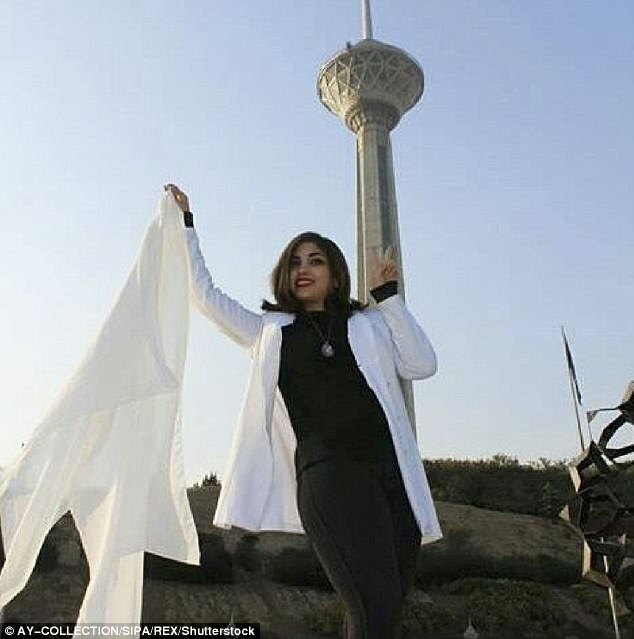 'While the law imposes a maximum of $12 or two months of jail time, the court has recently asked for a bail of $125,000 to release one of the newly detained women,' Ms Alinejad tweeted Thursday. 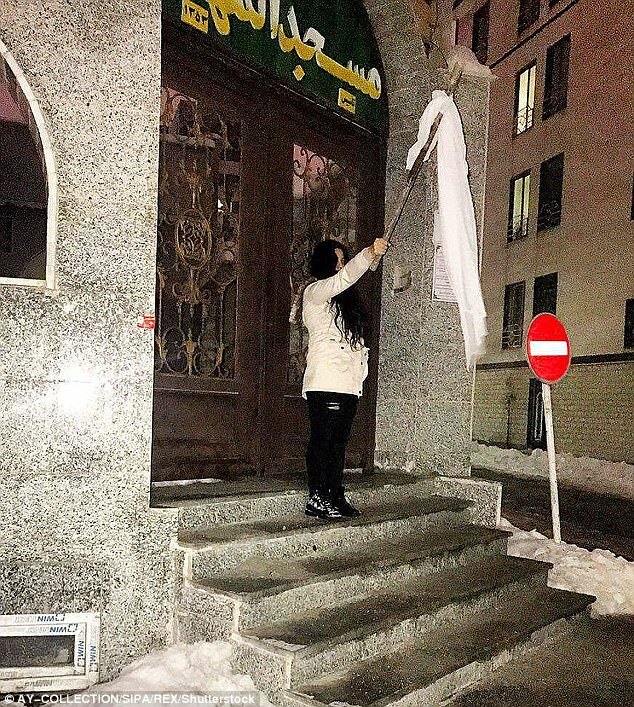 Although the wider anti-government demonstrations have ended, women across Iran are 'fed up' and continue to protest against 'the interference of religion in our personal lives', said the activist. Alinejad said she is now flooded with videos and photos of women imitating the viral video and she shares them on the My Stealthy Freedom Twitter account and Facebook page. 'These people are not fighting against a piece of cloth, they are fighting against the ideology behind compulsory hijab,' said Alinejad, who called the movement the 'true face of feminism'. 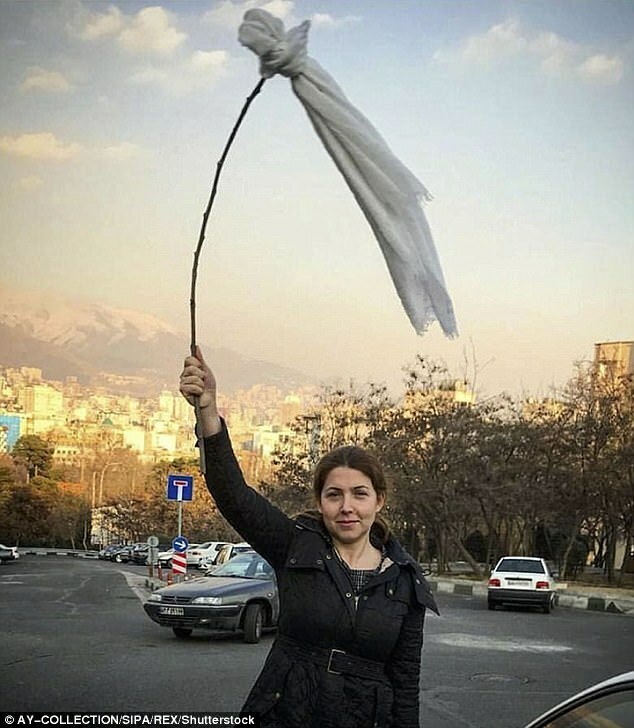 To campaign against the obligatory wearing of headscarves, Alinejad last year encouraged women to take videos or photos of themselves wearing white and upload them on social media with the hashtag #whitewednesdays. 'I wake up everyday with the voices of these women in my inbox,' said Alinejad from New York where she now lives. 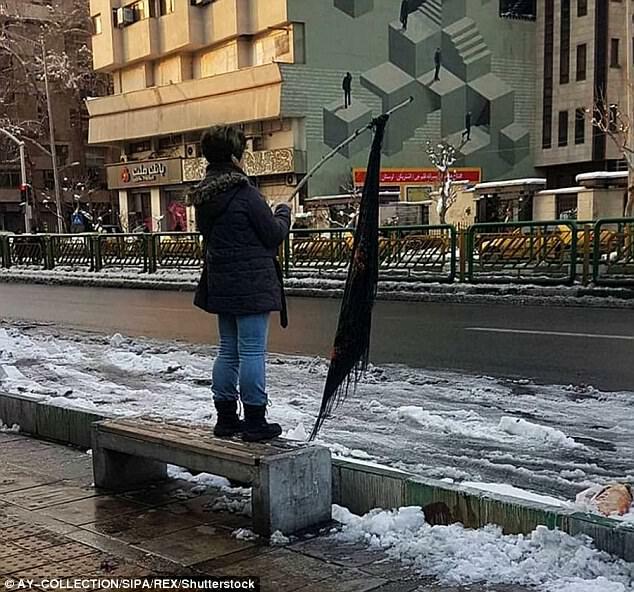 On Dec. 27, Vida Movahed stood bareheaded on a utility box on one of Tehran’s busiest thoroughfares, waving her white head scarf on a stick. Within days, images of the 31-year-old, who was detained and then released a few weeks later, had become an iconic symbol. 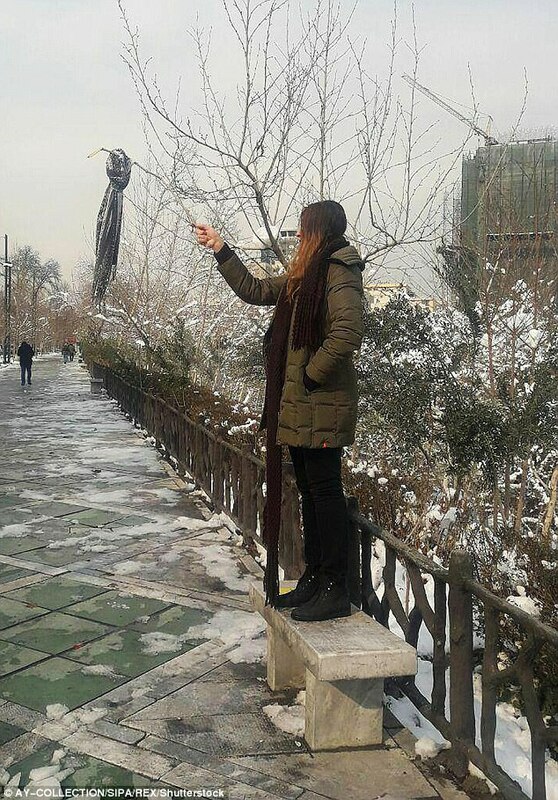 In the weeks since Ms. Movahed’s peaceful protest of the compulsory hijab, long one of the most visible symbols of the Islamic Republic, dozens of women, and even some men, throughout Iran have followed her lead. So far, at least 29 women in cities throughout the country have been arrested. These bold acts of defiance against the hijab are unprecedented in the nearly 40-year history of the Islamic Republic, but a movement that may have helped inspire them has been going on for years. It began on the social media account of a Brooklyn-based Iranian journalist named Masih Alinejad. In 2014, Ms. Alinejad started a Facebook page called “My Stealthy Freedom,” urging women to post images of themselves without the hijab in public places. Last year, she launched “White Wednesdays,” inviting women to wear white scarves on Wednesdays in protest of the compulsory hijab law. 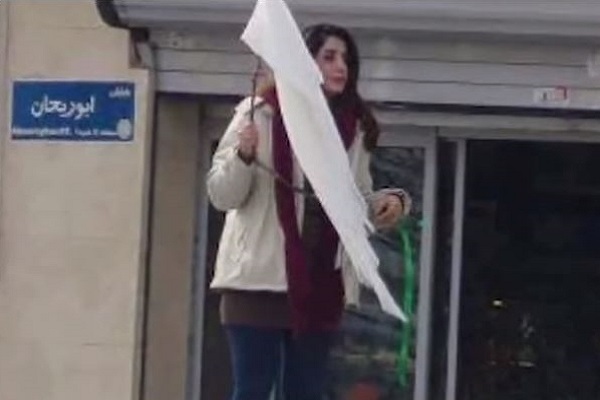 (Ms. Movahed carried out her protest on a Wednesday and held a white scarf, though her actual allegiance to Ms. Alinejad’s campaign is unknown). Ms. Alinejad, who worked as a journalist in Iran before emigrating to England in 2009, says her campaign came about by chance. She posted a photo of herself driving her car in Iran without hijab and invited others to share “hidden photos” of themselves on her Facebook page. The overwhelming response — the page now has more than a million followers — prompted her to focus more on the issue. “I was a political reporter, but the women in Iran forced me to care about the issue of personal freedoms,” she told me. For Ms. Alinejad and the protesters, the struggle against the compulsory hijab is about regaining a woman’s control over her own body, not a matter of questioning the validity of the hijab itself. 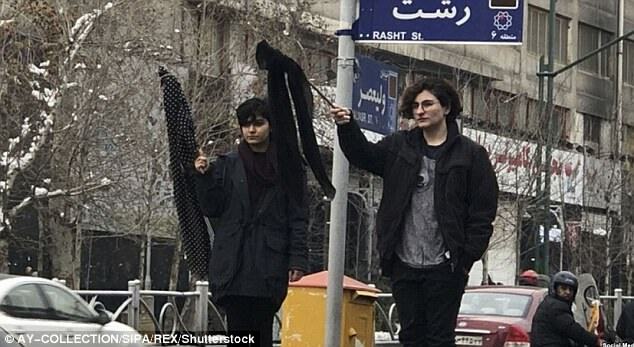 Now that bareheaded women are joined in these acts by women who proudly wear the full-body chador, it is clear that the movement on the ground is also about a woman’s right to choose how to dress — something that, over the past century, various Iranian leaders have tried to deny. The founder of the Pahlavi dynasty, Reza Shah, banned the hijab, in a gesture of modernization, in 1936, which effectively put some women under house arrest for years since they could not bear to be uncovered in public. The leader of the Islamic Republic, Ayatollah Ruhollah Khomeini, made the hijab compulsory in 1979. Mass protests by women were unsuccessful in overturning the edict. Pro-hijab campaigners invented the slogan “Ya rusari ya tusari,” which means “Either a cover on the head or a beating,” and supervisory “committees” — often composed of women in full chadors — roamed the streets and punished women they deemed poorly covered. Those who opposed the strict measure called these enforcer women “Fati commando,” a derogatory term that combines Islam — in the nickname Fati for Fatemeh, the prophet’s daughter — and vigilantism. While the requirements have remained firmly in place, Iranian women have been pushing the boundaries of acceptable hijab for years. Coats have gotten shorter and more fitted and some head scarves are as small as bandannas. This has not gone without notice or punishment: Hijab-related arrests are common and numerous. In 2014, Iranian police announced that “bad hijab” had led to 3.6 million cases of police intervention. But for years, many women’s rights activists have written off the hijab as secondary to other matters such as political or gender equality rights. In 2006, the One Million Signatures for the Repeal of Discriminatory Laws campaign, one of the most concerted efforts undertaken by Iranian feminists to gain greater rights for women, barely mentions the hijab. Iranian feminists have also been determined to distance themselves from the Western obsession with the hijab, almost overcompensating by minimizing its significance. Western feminists who have visited Iran and willingly worn the hijab have also played a hand in normalizing it. But fighting discriminatory policies has not resulted in any real change, as the crushed One Million Signatures campaign proved. So now Ms. Alinejad and a younger generation of Iranian women are turning back the focus on the most visible symbol of discrimination, which, they argue, is also the most fundamental. “We are not fighting against a piece of cloth,” Ms. Alinejad told me. “We are fighting for our dignity. If you can’t choose what to put on your head, they won’t let you be in charge of what is in your head, either.” In contrast, Islamic Republic officials argue that the hijab bestows dignity on women. Iranian women must keep it up until victory. The world evolves but Iran devolves. IRI devolved Iran. These Akhunds reversed everything Reza Shah done. Reza Shah is rolling over in his grave. These Akhunds took Iran back in history. It is like reverse time machine going back to 7th century “Invasion of Islam to Iran”. This is more or less spit in Reza Shah’s face! Reza Shah built a new Modern Iran for Akhunds to destroy it all and return Iran back to Arab Invasion time in 7th century. You can’t have both and you can’t be both! The only Iranian woman who is still a Muslim must be a stupid woman! So go educate yourselves on history of Islam and what Islam has done to Iran and women. 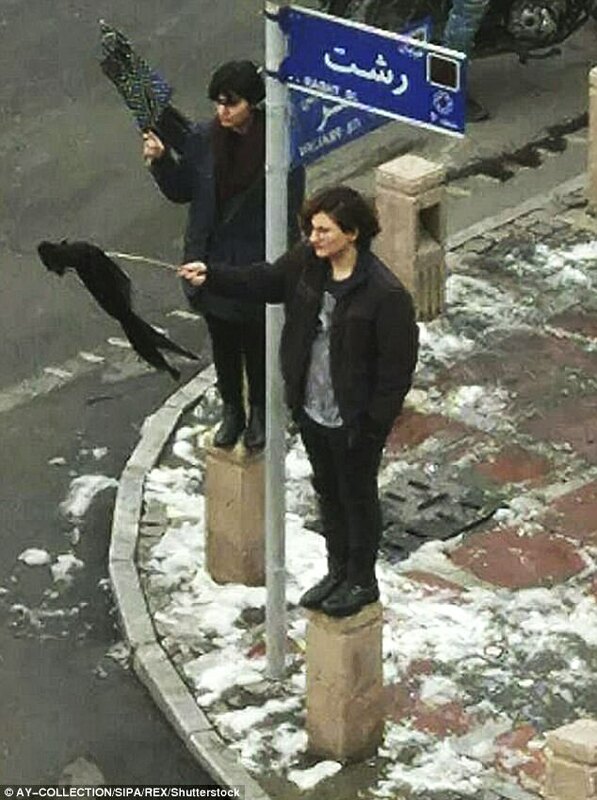 "Iranian Women Anti Hejab Protersts"
You are wrong. Regular members cannot delete their posts anymore. Remember after Kamran deleted many posts and made many topics meaningless, Ahreeman took his moderator power away and I took the deletion privilege away from the members? Maybe we should debate on it again to give the privilege back but I doubt Ahreeman will go for it. Sorry Suren, you can’t delete your own posts but you can edit them and you can preview them before posting so to see how they look. Hejab to women is brand to cows. The man brands his cows in his farm and puts hejab on his women. Hejab invented by Muhammad to possess, control and undermine women. Before hejab, the Arab women were having rights but after hejab they lost all their rights. If you look at it from another perspective, we are not Arabs or Muslims. We are Persians and in our culture women had high places. Women were superior ranks and lead the society in many aspects. When Islam came to Iran, women became slaves to men. The misconception in west is that hejab is a choice. The Muslim women who believe hejab is a choice, must read the history of Islam and how hejab was invented. Hejab is the worst phenomenon created to destroy women’s will, self respect and individualism. It is a body and mind control tool. Uneducated or misinformed women stranger to history of Islam, defend hejab. They need to educate themselves to history and reality of the Muslim societies around the world were women are commodities and inferior beings. The worst block for women in the west is the wrong concept of hejab and thinking that it is a choice or traditional costume. Hejab is forced then and it is forced now. In America, foolish women wear hejab to piss off Trump and that is the most ignorant excuse and reason to wear hejab! Look at Iran, half the Iranian women want the hejab off. This is not our opposition propaganda but it is the IRI own survey taken by Rouhani government! 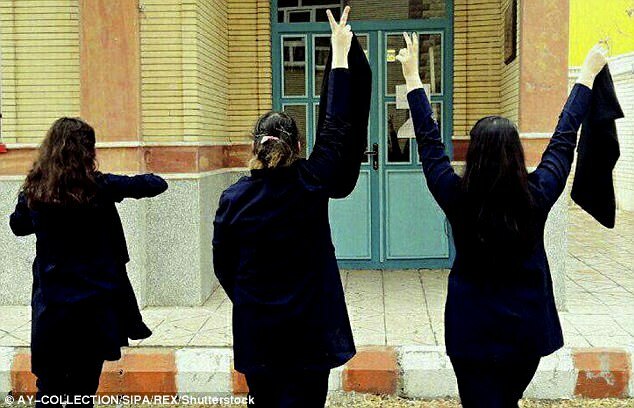 IRI can’t force hejab on Iranian women. We are not Arab, nor we are Muslim. We are Persian and mother culture of the world. When Arabs ate lizards in deserts of Arabia and washed them down with camel milk, women of Persian Empire ruled the land. They were Queens, Ministers, Generals and Administrators. To bring the Persian women down to the level of Savage Arabs and their inferior culture is a crime. Look at what we were before and what we are now! When we ruled the world, Arabs did not have water to wash their asses with, so they used sand and they got rashes! Call us racist but we don’t care anymore. We do not want the liberal political correctness garbage and we are definitely fed up with Islam and Muslims. It is time for a change. Dump Quran, Islam and Mullahs along with IRI Regime in toilet, give them a good wash because they don’t often get washed. Afterwards, dump them in the dumpster of history were other bad ideologies belong.